Michael Hoey's bid to win the Paul Lawrie Match Play event ended with a 2&1 defeat by Thailand's Kiradech Aphibarnrat at the quarter-final stage. The Belfast man was two up after two holes and three up after four but his opponent won the fifth and the sixth. Hoey birdied the ninth to restore his two-hole lead but Aphibarnrat won the 11th, 13th, 14th and 16th, one of those with a birdie, to close out the match. Hoey had reached the last eight with a 7&6 success over Gregory Havret. 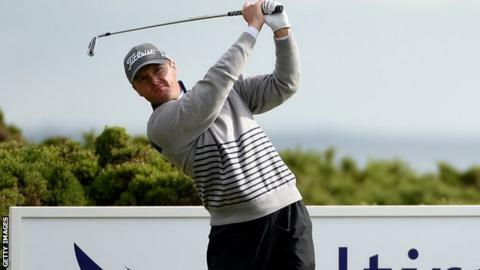 The Belfast man was four under for the 12 holes he played in the third round tie to record the biggest winning margin of the week at Murcar in Scotland. Aphibarnrat saw off South African Thomas Aiken 4&3 on Saturday morning to book his place in the quarter-finals against Hoey, a tie which was played in wet and windy conditions. Hoey had beaten Sweden's Kristoffer Broberg 5&4 in difficult conditions in the second round on Friday, having defeated Germany's Maximilian Kieffer 2&1 in the first round on Thursday. After struggling in the early part of the season, Galgorm Castle tournament professional Hoey has made the cut in his last six European Tour events and he finished in a share of seventh place at the BMW International Open in Germany five weeks ago. Hoey, currently 91st in the Race to Dubai standings, will be tournament ambassador at next week's Northern Ireland Open European Challenge Tour event at Galgorm Castle.